In March 2014, I was in my seat watching shows at Vancouver Fashion Week F/W 14. One night a new designer took to the runway that floored me - Zuhal Kuvan-Mills of Green Embassy - a series called "Earth." During the week I managed to connect with her in the showroom to get up close and personal with this talented artist and her collection to learn a little about what she was doing. The next time she came to Vancouver Fashion Week we managed time for an interview so I could go more in depth with her. Our friendship continued to grow over the next several years despite the great distance between us. Her intensity and passion for not only her art, but the people and environment around her knows no bounds. I am proud to call her friend. Here are a few things you might like to know. Zuhal was born in Turkey and lived in London before moving to Perth, Australia, where she lives on a farm with 4 dogs and a herd of 52 Alpacas. Her career path started as a veterinarian, then an educator and then a textile artist. Her love of animals have led her to embrace being a vegetarian. Her passions and commitment to change run deep with social and environmental concerns expressed through all her art including fashion design. It was while showcasing the beautiful textiles she created from her alpaca's wool a few years ago that things shifted. At a trade booth, she decided to drape the beautiful fabrics she was showing on models. Someone thought they were garments and asked her to be a part of a fashion show. A little over 3 years later she has showcased collections on the runway at fashion weeks around the world - London, Vancouver, Beijing, Paris and more. With each collection Zuhal highlights a concern dear to her heart. F/W17's inspiration came from the plight of our oceans. Always one to challenge the audience in more than one way, she also brought to the show the affirmation that we as human beings - no matter our race, colour, religion or sexuality - are all one family. To open the show the designer offered a heartfelt video introducing the theme Empty Ocean. To set the tone while the models walked the runway in her unique creations, she chose O SIEM by Inuk musician Susan Aglukark. The Empty Ocean Series was showcased on not only traditional models, but individuals of all ages, sizes and ethnicities. 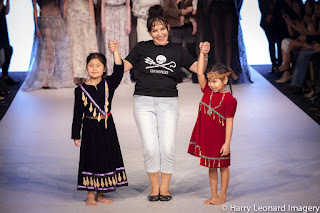 In a nod to the indigenous peoples of all nations, the show was opened by two young girls of the Tsleil-waututh Nation who are descendents of beloved Chief Dan George along with their mother. Warren Dean and Katherine Flandez of Studio Cloud 30 walked with their son Noble - an emotional moment for the audience as we listened to the words repeated, "We are a family." Zuhal's show was filled with incredible one of a kind fashions highlighting the fragility of our oceans, but it was so much more. The powerful impact on the audience was obvious and many stood to offer a standing ovation. On an important note - the designer reached out to The Sea Shepherd Organization and will be donating money from the sales of these one-of-a-kind pieces to their efforts. What's next for this designer/artist/activist? Zuhal is organizing the first ever Eco Fashion Week of Australia in Perth this November 2017. Please check back for more information. I would like to close by sharing a press release created for this Vancouver show by Robbin Whachell - founder of The Bahamas Weekly. Enjoy! "As an environmental activist, designer and artist Kuvan-Mills believes art and fashion impact our emotions and can move us to value our blue planet. This is her third time to VFW and she says she was inspired to return after hearing about the Kinder Morgan pipeline expansion and its threat to local waters, in particular that her current collection is her emotional response to the world's troubled oceans. She is currently supporting the world’s leading direct action ocean conservation organization, Sea Shepherd (Australia). Green Embassy is Australia’s first internationally recognized organic fashion label who base their work on the protection of nature, and natural resources, while focusing on bringing public attention and education to environmental issues. In November 2017, Kuvan-Mills will launch the inaugural Australia Eco Fashion Week in Perth. During her stay in Vancouver she hopes to inspire other designers to go ‘eco’ and has talks planned with Kwantlen University and Blanche Macdonald. "Vancouver has such a rich and beautiful coastline that should be protected for generations to come. I know that the First Peoples of its territory are as connected to their land and water, as Aboriginals are Down Under. Water connects us. Water is life. I hope to bring this awareness to local and international audiences." While forging her own path in the ‘slow fashion’ scene by not only designing and creating garments for quality and longevity, most of her fabrics come from the alpacas she raises on her farm in Perth. Her dyes are made from vegetation, like flowers, leaves, or vegetables. Focusing on modern, minimalist, functional and alluring garments for earth-friendly consumers, Zuhal finds inspiration within the textile crafting traditions of ancient times. Inspired by marine life and the ocean’s diversity of forms, shapes, colours, and textures, Kuvan-Mills used industrial fishing net remnants and recycled polyester made of trash, plastic bottles, drift / ghost fishing nets as her starting point for Empty Oceans. Using 100% certified organic Australian alpaca, merino, silk and recycled natural fibres, each artisan haute-couture Empty Ocean piece is a handmade collectible with higher meaning. "Fashion is a tool for me to reach larger audiences in my mission and passion to save just one tree from being cut, or save one wild animal from poachers. It is also my aim to support and help indigenous communities across the world," says Zuhal who will have Tsleil-Waututh Nation children dressed in traditional regalia walking the runway on Sunday at VFW. It is her hope to great a collaborative event between the First Peoples of both Canada and Australia whereupon dance, music, fashion and the arts can be shared. Kuvan-Mills' commitment to sustainability, organic agriculture, art and slow fashion is expressed in each extraordinary textile piece as a labour of love."